This has already been a feature of OpenStreetMap for quite some time, but it’s nice for Google to catch up. Something Google add which I don’t think is in the OSM data is a kind of ‘quality’, where dedicated (no cars) bike paths are one colour, roads with bike lanes are another colour, and other preferred biking roads have a dotted line. Although I’m a little curious about how they get the kind of information to highlight the dotted line routes, I think this is a great addition to Google Maps for all those who are keen bikers. Having released Google Buzz a few days ago and seen the iPhone and Android interfaces which took the GMail-centric UI and simply ported it across to mobile, I was looking for similar integration with my Nokia E71 (S60) device. I very quickly realised that there wasn’t a new version of the GMail application, but there was a new version of Google Maps. 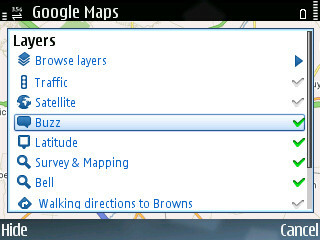 This new version of Google Maps has integration with Google Buzz in the form of a Layer. Once turned on, this layer puts speech bubbles anywhere Buzz has been made. Add to this the fact that Buzz can be associated with places and businesses, this gives an excellent way to provide tips for people to find when they’re travelling. I have to wonder, with Jyri Engeström having worked on features within Google Buzz, whether this is trying to, in any way build on the concept of the original Jaiku service (not the newer JaikuEngine-based service), where multiple feeds are taken into a single activity stream with location attached. One of my personal main use-cases of Jaiku was for travelling, so I could find people in the area to go for a drink with, and I have been lucky enough to get to know several people from around Finland because of it. 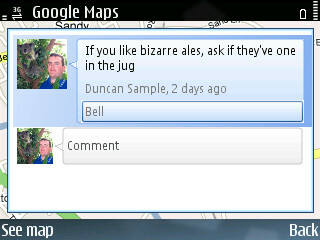 I’ve put some screenshots of how I used it on a night in the pub on Saturday. It’s not just the Guardian that are fighting for ‘Free Our Data’. Ernest Marples set up a site offering postcode data for free, sourcing the data from Free The Postcode and utilising them in two key (free) services, PlanningAlerts.com and Jobcentre Pro Plus. Both services targeted at making public services more accessible and geographically relevant. Ernest Marples got a cease and desist request from Royal Mail (the controllers of the postcodes in the UK), since they’re in breach of copyright and numerous other licenses for using it in the way they are. So the service has been shut down and they’ve now launched a campaign to petition for Royal Mail to create a new (free of charge) license for use of the postcode data for non-profit purposes. This new license, if created, would help give developers of free services (like myself) the opportunity to provide more geographically-relevant data to UK users. Sign the petition on the Number 10 site or write to your MP and request them to sign EDM2000. I’ve done my bit, by both signing the petition and writing to my MP – (Shailesh Vara, Concervative MP for North West Cambridgeshire). Having been on a road trip to Lapland in the summer and used a lot of different ways to track my location and share content (I know, I still need to write about it), Both Nicola and I are going to the Ice Hotel in Swedish Lapland for 4 days. The main issue we had was keeping our mobiles logging our trip. They lost the satellites fairly often (and in the case of my N95 didn’t get much signal to begin with) and of course with GPS turned on constantly they didn’t really last that long on battery. So for this next trip I’ve decided to look at a dedicated device for location tracking. The site for this device is pretty, and they have some nice software for geotagging photos sending to Flickr/Picasa, although it’s Windows-only. Other than that, it’s pretty hard to find information about the devices, compare the differences in specifications and even to see how many points it can record or how long the battery lasts and how to recharge it. The device looks really nice though and for the average user it would be a great, small tracker to fit in your pocket. Especially at £45. 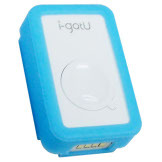 Not quite as pretty as the i-gotU, but has lots of details about the huge battery life (37 hours at 10 second interval captures) and more status indicators on the front of the device, as well as a hardware interval selector on the side. 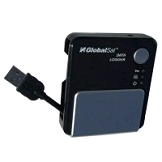 Since the shops I looked at didn’t have any i-gotU in stock, and for the known brand of GlobalSat, I decided on the DG-100. For this trip I’m planning on doing most of my photography using my Canon 350D SLR and Canon MD235 MiniDV camcorder, so there won’t be much live content apart some rare photos from my N95 and some Jaiku updates. After the trip I’ll make sure to bookmark some time to posting what I used, as well as how they coped in the freezing temperatures. Glenn Letham of GISUser attended Nokia’s Open Lab event and hosted one of the sessions, naming it Join the Journey. It got me pretty excited to see others voicing the same opinions on the possibilities of location based services and embedding automatic sensing into mobiles. The latest enhancement to Google Maps Mobile allows people that don’t have a GPS enabled phone to get approximate location (within 1km) using mobile operator cell locations. This is a good enhancement, similar to the Network-based and AGPS feature in new S60-based phones and also the offerings from Navizon. The questionable thing here though is, what cell location data is Google using to estimate this? Nokia and Navizon have started their own databases (Navizon includes both Mobile Cells and WiFi APs)… is Google starting another? What are the chances of standardising and creating an ‘open location database’? 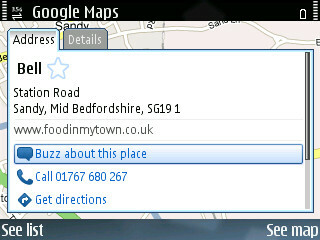 Google have started to allow users to correct their address gazetteer. By searching for your address (I think this is US only for the moment) you will be shown the address marker as normal, but now when you click on the marker you will have the object to edit it and drag the marker to where you think it should be. This sounds to me like free labour on the pretence of better service in the future… a cunning ploy by Google, and one which I will probably join in on when I find a business I’m looking for has it’s marker out of place. For minor changes it’s an instant fix, but if it’s wildly out (200m or more) the change gets put in a moderation queue. I’ve been wondering about this kind of thing for a while and it’s nice to see more collaborative mapping happening… now, if we could only convince Google to collaborate on OpenStreetMap. 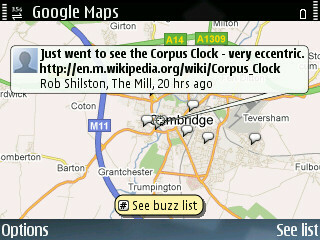 Google have added a new collaborative feature to My Maps. If you are logged in when using Google Maps you will now see an ‘Edit’ button when viewing user generated maps that you have permissions to modify. This is a great addition to the Google Maps feature line-up and should come in handy when you’re planning that next outing with friends. If you tried the previous Google Mobile Maps application before and have an S60v3 phone, you might want to update to the new native version. It’s got a smoother display and now supports GPS, so all you N95 (or bluetooth GPS) owners can see where you are. It doesn’t do satnav yet, but it can’t be too long before Google comes up with something to rival the subscription-only navigation of Nokia Maps and Tomtom. The only benefit Nokia Maps currently has (on top of navigation) is that you can download the maps and store them on your phone. If you’ve got a mobile barcode reader (and if you haven’t, why not get one? ), you can use the barcode below to go straight to Google’s download page. You may have seen the latest Steve Jobs WWDC Keynote and iPhone adverts and be wondering about how good it will perform as a GPS device (as you would any modern mobile phone) or for Location Based Services (LBS). A lot of people are looking forward to the release of the iPhone, and I guess only time will tell as to how it performs, but I can see some things which may backfire with the fully online (or at least that’s what it seems) platform. Steve hasn’t mentioned anything about GPS support within the iPhone, but I don’t see it not having support. Unless there are some sophisticated caching mechanisms, maps are going to be unavailable in areas of low mobile network coverage. Points of Interest appear built into the phone are most probably the normal Google Maps, and possibly not very customisable. Other POIs are capable through the web browser, with AJAX these websites can appear as if they are native applications on the phone, but only through clicking on an address/location of some sort to trigger the Google Maps view of that point. I hope to be proven wrong, but those are my reservations. If I am proven correct, this would surely be a major issue for anyone (like myself) who uses GPS/GIS in anger. Any ideas?